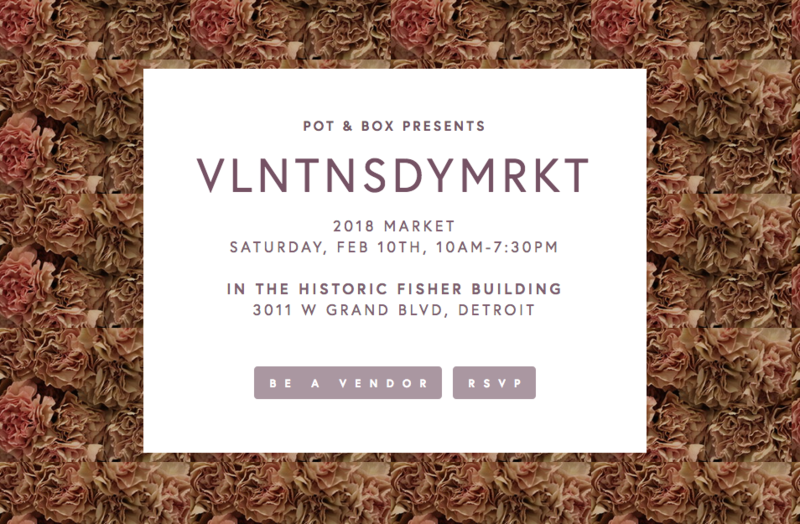 Handmade Detroit | VLNTNSDYMRKT – New Home & Looking for Vendors! VLNTNSDYMRKT – New Home & Looking for Vendors! VLNTNSDYMRKT, hosted by our friends at POT + BOX is now accepting applications for vendors! This year’s market is now moved to the historic Fisher Building, and we can’t wait to shop there! For more information, and to apply, go to the VLNTNSDYMRKT website. VLNTNSDYMRKT is not affiliated with Handmade Detroit, we just thought we’d share this info with you. Please contact the folks in charge via the links above, not us, with any questions you may have about applying for this show.